Bard Lubri-Sil Two-Way I.C. Infection Control Foley Catheter With 30cc Balloon Capacity incorporates a technologically-advanced formulation consisting of bacti-guard silver alloy coating and hydrogel which reduces adhesion of the bacteria most commonly associated with catheter-associated urinary tract infections (CAUTIs). The coating on this catheter is designed to minimize biofilm formation and enhance patient comfort. 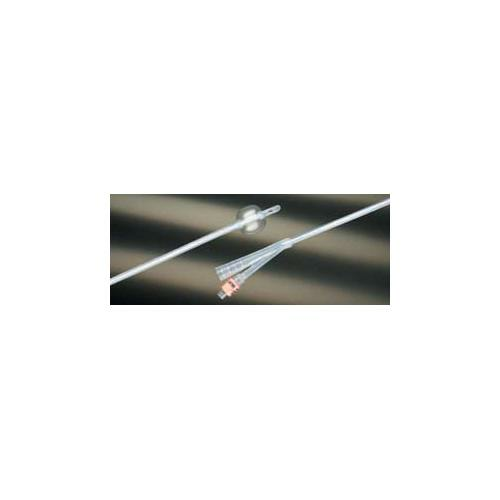 - Ensure that the Bard Foley catheter balloon is positioned well within the patients bladder. - Slowly, with a gentle, constant force, inflate the Bard Foley catheter balloon with the volume prescribed on the package. Note that a 5cc balloon must be inflated with between 9cc and 10cc of sterile water. - Improperly inflated Bard Foley catheter balloons may cause drainage and deflation difficulties. - Slide the plunger of the syringe up and down the barrel of the syringe several times to "loosen it up"